When Justin and I met three (four) weeks ago we discussed using our blog posts to engage in some sort of Dialogue, with the idea that one of us would post, the other would respond, and so it would go. Justin and I met each other sometime in the early 2000’s, most likely through Powell, Director of p|m Gallery in Toronto, so we both kind of figured that between our shared interests, our mutual acquaintances and our tendency to be a bit chatty, that it wouldn’t be a problem. But, I dropped the ball, and this post is an attempt to fill you in on what I have been up to this past month in Calgary. I was brought here by both M:ST and Truck Gallery, to show SOUNDBIKE and Bike Hack + SoundRide, (described by the deservedly-smug Keltie, who, on her first try, could solder more neatly than I can) but also to take part in CAMPER, the Contemporary Art Mobile Public Exhibition Rig, hosted by TRUCK and taking place, literally in a camper. I’ve soldered and programmed, reprogrammed and chatted, made runs to HWV Tech (best electronic supplier ever! just up the street!) and instigated a few things. The advantage to being in a place for a month is the opportunities to make meaningful connections with the community. By “meaningful connections” I mean (in my own too-many-years-in-arts-administratrivy) way, that you can actually get to know people, hang out, learn things and also share things. I’ve been very lucky to have had the opportunity to show my work all over, but usually, I arrive, install or perform, and then have to leave. And while most local artists I meet are very welcoming, you do feel a bit like an alien, you’re a part of things because you’re part of whatever thing goes on, but really, your kind of not – people ask you questions, you try to meet people, but ultimately time constraints get in the way. William Huffman and I have been having what we call “Virtual Cocktails” for about a year. William is arts administrator, curator, educator and writer is currently the Associate Director of the Toronto Arts Council. The setup isn’t that elaborate (Skype + webcam + speakers + alcohol) but they are a lot of fun, and a great way for people from different areas to meet each other. Our first cocktail, which was sometime in early 2007, brought together William, myself, Cheryl Rondeau, Marie Legault and Rene Rivoire. William, Cheryl, and Marie were in Toronto, I was in Buffalo, and Rene was in Marseilles, France. When I arrived in Calgary, one of the things that struck me right away was the degree to which the artist-run-centres here collaborate with each other. Staff members often serve on boards of other galleries. They co-produce residencies. They borrow gear. They share staff members. They scheme about buying buildings. Toronto ARC’s also collaborate, but I wasn’t sure to what extent, and I’m not always in the loop. So I thought that since William spent quite a few years working at A Space, that perhaps it would be interesting to have an informal dialogue on the state of artist-run-culture in the two cities. The first cocktail was interesting and enlightening for all of us, I think – we discussed HR practices, board structure, disaster plans and some of the similarities and differences of the state of arts funding in our cities. Tomorrow, we’re continuing the discussion at noon at The New Gallery, and at the TAC in Toronto. After all, it will be cocktail hour somewhere. 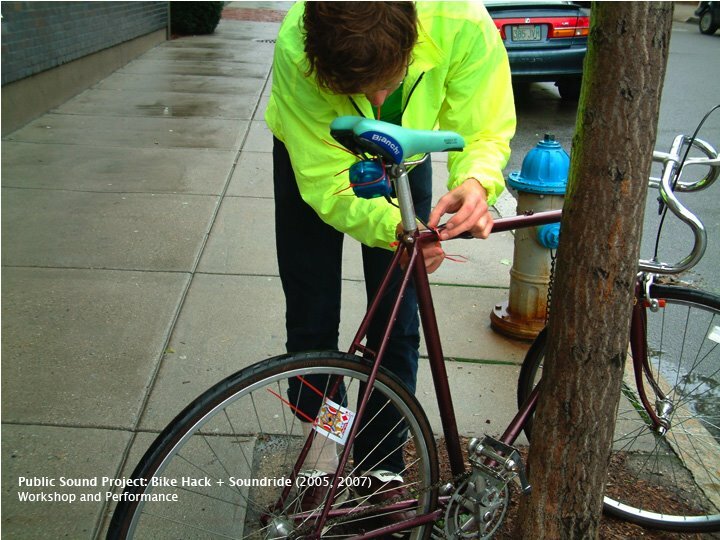 Bike Hack + Soundride was first performed in Cambridge, Massachusetts, as part of Glowlab Open Lab. This show was also the first exhibition of the SOUNDBIKE. In the performance, I invite members of the public to make simple bike-mounted microphones, which are connected to small amplifiers and attached to your bike. We then ride through the city en masse, we become a very loud mobile sound piece, which changes according to the number of riders, our speed and our location. I’ll write more about this after tomorrow, but if you’re near the Good Life Bike Shop @ Eau Claire tomorrow, feel free to join us.